Training and Racing With a Power Meter Journal: Ventoux as Stage 20...are they serious? Ventoux as Stage 20...are they serious? by Hunter Allen - I am sure that when the race director of the Tour de France, Christian Prudhomme proposed that the next to last day of Le Tour finish on the summit of Mt. Ventoux, he got some quizzical looks, opposition and downright questions of his sanity. From a logistical standpoint alone, the stage would be tough for the riders, with a big transfer afterward to Paris and the fact that it would be going against the normal time trial which usually makes up the penultimate stage, I am sure that Monsieur Prudhomme received quite the opposition to this idea. However much it was, he got it passed through the committee and the race route was announced to even more disbelief from the riders and the team directors. Mt. Ventoux? On the penultimate day? Are they serious? Finally that day came for the riders, and it was Stage 20. Yes, Stage 20 and still hard to believe. Most of us have no idea what it takes to do a 21 day stage race, the level of soreness in the legs or mental effort needed to keep on pushing each day to get to the front, or how tired you get of eating, much less doing a massive mountain top finish on the 20th stage! Chris Anker Sorenson does though, and as a domestic on the Saxo Bank team, he had some serious responsibilities in getting the Schleck brothers to the front, setting tempo on the lower slopes of important climbs and helping bring bottles to his teammates throughout the race. 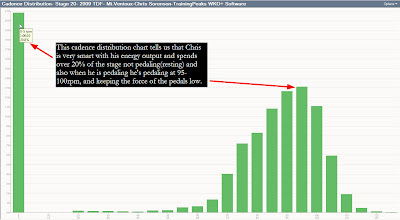 Chris used his SRM power meter for each of the stages and shared those files with us on http://www.trainingpeaks.com/. A big thanks goes out to SRM, Team Saxo Bank and all the people involved in bringing those files to us to review and examine. Let’s take an in depth look at that infamous Mt. Ventoux stage and see what Chris had to do for his team and for himself to just finish the stage. Figure 1. 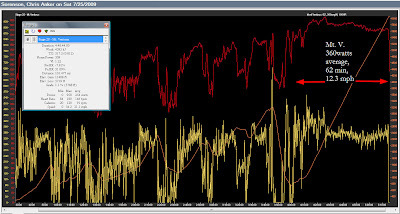 Chris Anker Sorenson's power data from stage 20 of the 2009 Tour de France. With just over 100 miles to race, four categorized climbs on the profile BEFORE Mt. Ventoux, and over 11,000 feet of climbing, Chris burned over 4600 calories for the day and averaged 21.1 mph for the stage! (See Figure 1 above). His normalized power (power he would do if he pedaled smoothly and steadily for the whole stage) was 309 watts for nearly 5 hours of racing, and his best 20 minute average power was 398 watts as he set tempo at the base of Mt. Ventoux. This pace setting effort in the beginning of the climb was not only an incredible effort at 398 watts, but it also was his BEST 20 minute effort for the entire Tour! When I see that an athlete does his very best effort at the end of a long stage race, then that tells me that he has improved his ability to recover over the duration of the stage race, he has taken good care of his body during the race, he has the ability to ‘rise’ up to the demands and needs of the team and lastly….he underperformed at the beginning of the race. In this case, Chris most likely underperformed at the beginning of the Tour because he knew that he was going to have to work for the team in the latter parts of the race, (however remember that Saxo bank had the yellow jersey (Cancellara) in the early stages of the race as well) so Chris really had to meter out his efforts without overdoing it and therefore just didn’t get the chance early in the race to show us what he could do if he went all out for a stage victory. When we examine the power file for Stage 20 further, one important thing becomes clear as well and this might provide a clue to why Chris was able to put out his very best 20 minute power on this penultimate stage. As I have stated in the past, the road racers that win the most pedal only about 83% or less of the time of the race. The best road racers have learned how to pace their energy expenditures throughout the stage and put out effort only when absolutely necessary. In other words, the best road racers are lazy and the best stage racers…even lazier! In Stage 20, Chris only pedals 80% of the time (see Figure 2 below), and that means nearly an hour of the stage he spent coasting and not pedaling, which is the mark of a good road racer and also gives us some insight in why he could do a huge effort on that stage. With the cumulative effects of resting more than most other riders in each stage, one can see that just by resting more in the peloton over a 21 day race can give you a huge advantage near the end of the race. Figure 2. Distribution of cadence for the entire stage. The next most interesting thing about Chris’ power file is the Mt. Ventoux climb itself. 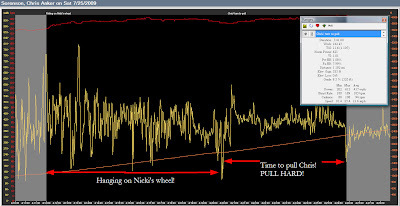 First off, at the beginning of the climb, you can see his power fluctuating highly in the first nine minutes (see Figure 3 below) and this was because he was sitting on his teammate’s wheel- Nicki Sorenson- as Nicki was the first one on the team to set the pace. After Nicki was done with his turn at the front, it’s up to Chris, so he nails it at his limit and pushes the pace harder than he has done in ALL the previous stages for over 5minutes at 418 watts! This was Chris’ 2nd best 5 minute effort of the entire tour with his absolute best 5 minute effort happening just before...at the base of Mt. Ventoux! So within the span of about 20 minutes, Chris had done his best 5 minute wattage, his 2nd best 5 minute wattage AND his best 20 minute wattage for the entire 21 stages!!!! Clearly, an amazing effort for Chris and this really shows his potential for stage racing and for future success. Figure 3. The start of the Ventoux climb. The next thing that I find highly fascinating in the climb up Mt. Ventoux is Chris’ cadence on the climb. When he was following Nicki and then when he took a pull at the front, which was a total of 17 minutes of effort at over 400 watts and an average heart rate of 181 bpm, his cadence was relatively high. During these 17 minutes, Chris’ cadence was right at 100 rpm and clearly when Chris has to go ‘full gas’, then he needs to keep his cadence right near that 100 rpm mark to produce the most amount of watts. After these first 17 minutes (when teammate Andy Schleck started to attack! 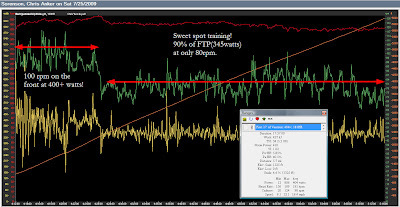 ), then Chris’ job was over and he immediately dialed back the intensity to a more do-able wattage of 345 watts (roughly 90% of his FTP) and dropped his cadence to 80 rpm (see Figure 4 below). Initially you might think, well…it got steeper so he could only do 80 rpm, but in reality the steepness of the climb didn’t change at all when we examine the elevation data from his downloaded power file. This really highlights the roll that cadence plays in the production of power at your absolute limit. In the case of Chris Sorenson, there is a 20% difference in cadence (from 100 rpm to 80 rpm) which causes a 15% difference in wattage that he can produce. That 15% wattage difference isn’t just any 15% difference, but it’s THE uppermost watts that he can produce, which counts as a very significant amount of effort and the difference between being able to do your job for the team or not. Figure 4. Power and cadence during the first 17 minutes of the climb vs. the last 45 minutes. Clearly, this is just a snapshot of the toughest 21 day stage race in the world, but it also goes to show just how hard these riders can continue to ride day after day. One begins to wonder at what point (how many days?) would all the riders begin to slow down significantly and eventually ride at a speed of 14mph for the entire stage? Making the hardest mountain top finish on the penultimate stage made for an exciting stage, huge spectacle and great battle, even if in the end the general classification didn’t change turned out to be a great idea for this year’s Tour. Congrats to Chris and all the riders on the Saxo bank for a very impressive Tour! I am sure I won’t get any thanks from the riders in this years’ TDF, but I commend Monsieur Prudhomme for taking such a bold step and making this stage such a memorable one. I hope he will continue with other surprises for 2010!